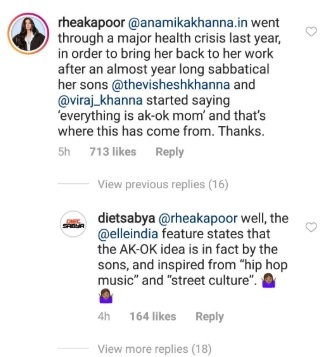 Sonam & Rhea Kapoor Called Out Diet Sabya On Instagram & What Happened Next Was Unreal! We have said it before and we will say it again: The Kapoor sisters work fashion like no one else. They are fun, fierce, fashionable, and we are forever in awe of them. 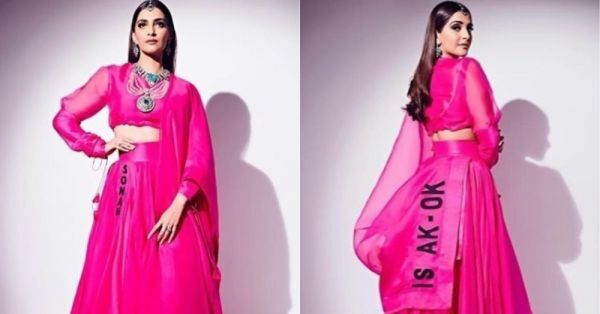 You may well remember Sonam Kapoor wearing a pink Anamika Khanna lehenga with a copy that read 'Everything Is AK-OK' a while ago for the Ambani wedding. Her look is in the news again, but for a different reason. 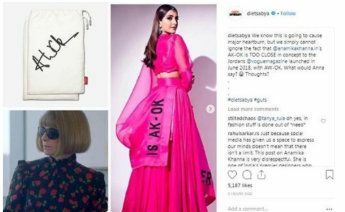 Diet Sabya, the Instagram account that was inspired by the well-established and followed Diet Prada, posted a series of pictures, calling Anamika Khanna's AK-OK concept on the lehenga "TOO CLOSE" to the one seen in US Vogue in 2018. 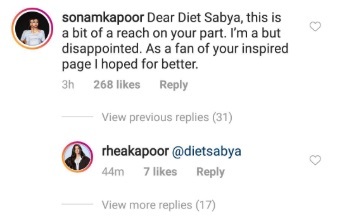 Soon after, there was a comment made by Sonam Kapoor on Diet Sabya's picture where she expressed her disappointment. "My dear friend Anamika Khanna had gone through a terrible illness in the last year. Her beautiful twin sons Viraj Khanna and Vishesh Khanna banded together and surrounded her gave her comfort and inspiration. The common slang that is used amongst people is A-Ok in America. Viraj and Vishesh who just returned from America after four years in the prestigious University of Southern California, used the same term playfully with their mom when she was down, saying “mom everything is going to be AK-OK”. Dear Anamiks I’m so glad everything is eventually AK-OK. I am so so fortunate to be your muse and Rhea Kapoor and I get to collaborate with you. I hope I never take you for granted. Love you so much! I shed a tear when I wore this outfit because I know it was inspired by your boys and they gave you strength during your lowest. " 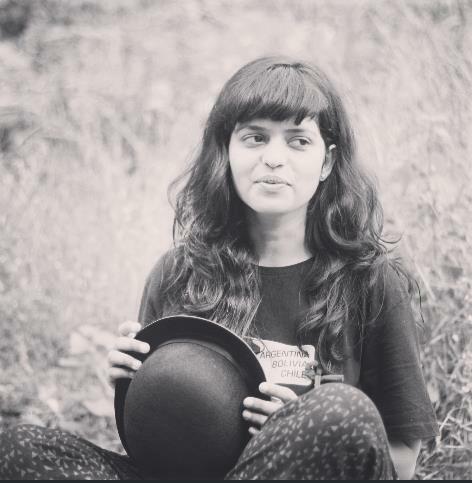 Thanks to the uproar, Diet Sabya decided to archive the post and issue an apology (we personally think they could do better) to its 'followers'. Too little too late, huh? Dear Diet Sabya, calling out plagiarism is a great move, but only when it's valid and called for.